This year, during the week leading up to the annual St. Patrick’s Day celebration, the 7th Annual Irish-American Crossroads Festival featured both traditional and cutting-edge musical acts and explores the ancient roots and modern influences of spirituality in the Irish-American community. Irish-American Crossroads 2010 also continued with its commitment to reveal the hidden histories of the local Irish-American community. Irish-American Crossroads 2010 opened with a performance by Tommy Sands, renowned singer-songwriter and peace activist from Northern Ireland. 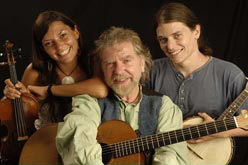 Sands performed with his daughter and son, Moya and Fionán in this rare local appearance. The performance featured music from Tommy’s recently released CD, Let the Circle Be Wide. Tommy has been called “The most powerful songwriter in Ireland, if not the rest of the world”, as he is a rare combination of singer, songwriter, storyteller, author and social activist who captivates audiences with the same musical skill and charm that earned him the respect of fellow musician, Pete Seeger, and many others. Music, song, and dance featured young dancers from the Murphy Irish Dance Company and traditional Irish music & story-telling by internationally celebrated fiddler, Colm Ó Riain! On this day, we invited the public to join the Irish-American Crossroads Festival and its featured guests to explore the multifaceted nature of spirituality in the Irish-American experience and its links to ancient roots. This “roundtable conversation” featured: Josephine Coffey, a leader of tours to Sacred Sites of Ireland and coordinator of the Ancient Irish Mysteries study group in San Francisco, Patricia Monaghan, a poet, teacher and author of books on Irish and Celtic spirituality, mythology and ecology including, The Red-Haired Girl From The Bog: The Landscape of Celtic Myth and Spirit and Irish Spirit: Pagan, Celtic, Christian, Global, Sister Maureen O’Brien, BVM, Pastoral Associate at St. Teresa of Avila Parish, San Francisco and member of the Sister’s Council of the Archdiocese of San Francisco, and Catherine Regan, Ph.D. is a clinical psychologist and spiritual director. 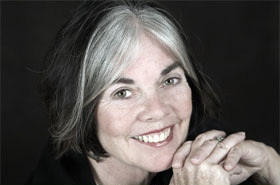 She is on the program staff of Mercy Center, Burlingame where she trains spiritual directors, teaches Mindfulness Meditation, and coordinates the Centering Prayer Program and Conscious Evolution group. Her great interest is in cultivating contemplative consciousness and fostering a mutually enhancing human-Earth relationship. Moderated by Hillary Flynn. An opportunity for reflection on the topic of “Irish-American Spiritualities” continues with this facilitated workshop by Maureen Murdock, author, educator, Jungian-psychotherapist, and photographer. Participants were given the opportunity to reflect upon and write about their experiences and beliefs related to spirituality with the aim of expanding their understandings of what an Irish spiritual inheritance contains. Irish-American Crossroads 2010 continued to explore histories of the local Irish-American community through this storied event. This evening featured Barney Crotty, former head of the San Francisco Retired Employees’ Association, Kevin Mullen, former Deputy Police Chief of San Francisco, and author of The Egg Man’s Son: A San Francisco Irish Life, Clare M. Murphy, recently retired Executive Director of the Francisco Employees’ Retirement System (SFERS), and Bob Twomey, District Director for Assemblywoman Fiona Ma, representing San Francisco’s 12th District. Moderated by Tony Bucher of the Irish Herald, this night highlighted the legacy of civil service within the Irish community. We were honored that San Francisco Supervisor Sean Elsbernd also joined us in welcoming the public to this event. Music at the Crossroads continues with a performance at the St. Patrick’s Day Parade Festival at United Nations Plaza at San Francisco’s Civic Center. The band performed a blend of music — traditional Irish tunes, American Swing, as well as their fiery signature music, gypsy jazz — from their most recent CD entitled, Giniker. This CD derives its inspiration, in part, from the work of the late Daniel Cassidy, author of How the Irish Invented Slang: The Secret Language of the Crossroads. In his book, Cassidy described how “giniker” is from the Irish language, meaning “lightening” or “fire” and “jazz”, also Irish in its origins, means “heat”. So, “jazz” is the heat we feel when “ginkier” strikes! This musical performance was a great show featuring a unique sound that is distinctly Irish-American in its originality and creative inspiration — a true example of music at the “Crossroads”! 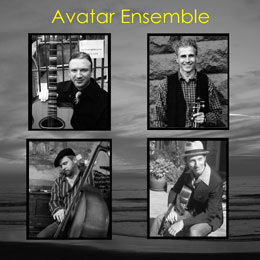 For more info on the Doug Martin Avatar Ensemble visit www.dougmartinguitar.com. Location: United Nations Plaza, Civic Center, San Francisco. 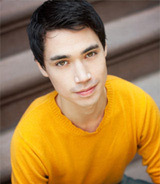 Audiences joined award-winning Irish dancer and choreographer, Nicholas Yenson, who was (at the time of the Festival) touring Canada, Ireland and the United States with Riverdance. He lead an introductory Irish step dance workshop that included a discussion about the history and impact of Irish-America on Irish dance, as well as the impact of Irish dance on the American entertainment industry. This introductory class welcomed adults of all ages and abilities.